Photo from the Naperville Heritage Collection, Illinois Digital Archives. 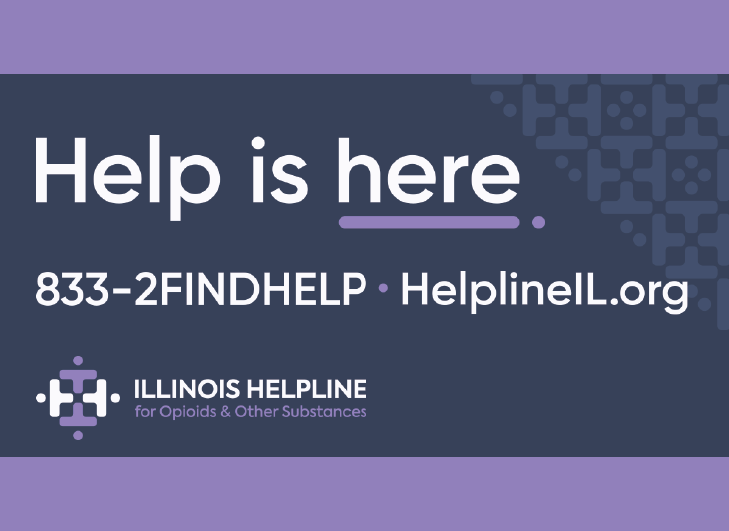 A service of the Illinois State Library & Office of the Illinois Secretary of State. When the Illinois General Assembly is in session, Representatives and Senators make their way to the Illinois State Capitol building at the corner of 2nd and Monroe in Springfield. But they haven’t always met there. In fact, this building is actually the sixth different structure in Illinois which has served as the state capitol since the first General Assembly met almost 200 years ago. 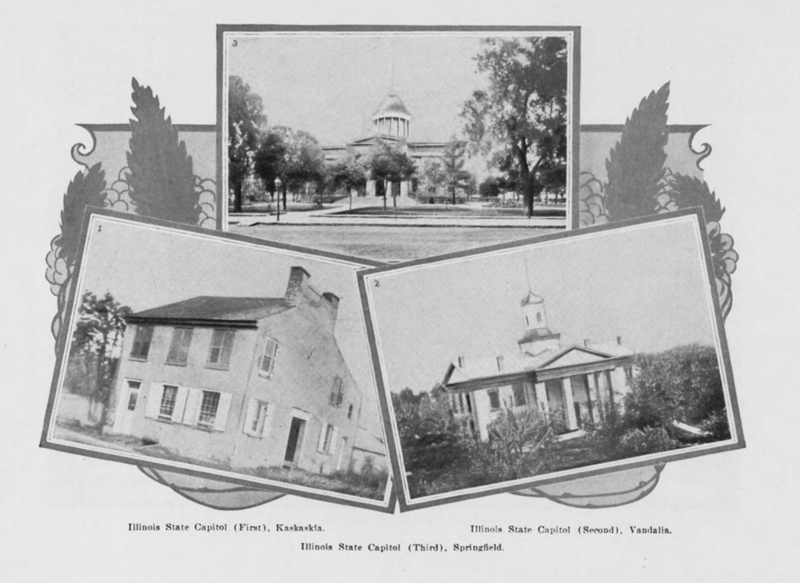 Illinois’ first capital city was the Mississippi River town of Kaskaskia. It was here in 1778 that George Rogers Clark defeated the British during the Revolutionary War. The town soon became the administrative center for the area, and eventually the territorial capital of Illinois. At statehood in 1818, it was the logical choice for the first state capital. Governor Shadrach Bond took the oath of office as Illinois’ first chief executive in Kaskaskia. But the two-story brick building where the First Illinois General Assembly held its session was located in a less than ideal site. When the mighty Mississippi River rose out of its banks, the town would flood. When the river changed its course later in the 19th century, Kaskaskia found itself on the Missouri side of the river, though still a part of Illinois. Today, the former capitol building is no longer standing. In the town of Kaskaskia however is the Liberty Bell of the West, a bell cast in 1741 and rung by local residents to celebrate the defeat of the British in 1778. Long before the river changed course and cut off the village of Kaskaskia from the rest of Illinois the capital city was relocated north to a town on the National Road – the main thoroughfare across the young nation from the east coast. Vandalia was chosen in 1820 to be Illinois’ second capital city, and a new capitol building was constructed there. But it didn’t last long: it was destroyed by fire in 1824. So a third building was constructed, which served as Illinois’ capitol until 1836. That building cost $15,000. By the 1830s, the state was growing and expanding. With more population growth in the north, Vandalia was no longer as centrally located for the state’s residents as it had once been. Pressure began growing in favor of moving the capital city to a new location farther north. In 1833, the General Assembly put the question up to the state’s voters: where should the state capital be? 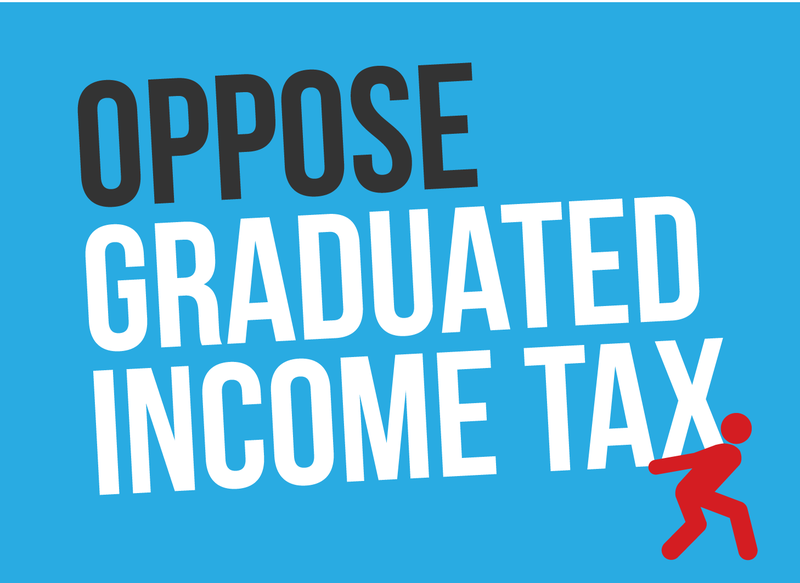 The choices were Alton, Jacksonville, Peoria, Springfield or staying in Vandalia. The pro-Springfield forces were led by a young State Representative named Abraham Lincoln and eight of his fellow legislators from the Springfield area. Recognized for their collective height, the group became known as the Long Nine. Concerned Vandalia residents thought they could help their cause by constructing a new, more stately-looking capitol building. So in 1836 they tore down the existing structure and built in its place a brick structure; Illinois’ fourth capitol building, which still stands today. But it wasn’t enough. 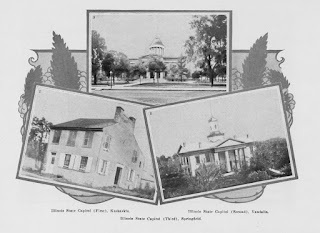 The capital city was relocated to Springfield in 1839. There work began on a new state capitol building at 6th and Adams Streets. It was in this fifth state capitol building that Abraham Lincoln rose to greatness. In 1858 he gave his “House Divided” speech in Representatives Hall. He spent time in the building on a November night in 1860 as the results of that day’s Presidential election were rolling in. It was also in this building that mourners gathered for his funeral in 1865. By the end of the Civil War, Illinois was among the fastest growing states in the nation. Its population had expanded from 850,000 in 1850 to 1.7 million in 1860. Then it grew to 2.5 million in 1870. Chicago was emerging as the commercial crossroads of the Midwest, and industry was booming throughout the state. The state was rapidly outgrowing its capitol building and a new building was needed yet again. Land was chosen just west of the existing state capitol site, and ground was broken in 1868. It would take 20 years and $4.3 million before the sixth state capitol building was completed. The building at 6th and Adams was given over to Sangamon County for use as its courthouse, before the state re-acquired it many years later. It was then painstakingly deconstructed brick by brick and renovated, then re-constructed with each brick put back in its original place. It is now a state historic site, but it briefly returned to its original purpose about a decade ago when renovations to the House and Senate chambers in the current state capitol forced the legislature to meet at the Old State Capitol for a short time. The House and Senate have met in the capitol building at 2nd and Monroe since they moved into their new home in 1877, while work on the building was still ongoing. The influence of the dates of its construction is clear to a visitor today as the building is filled with paintings and statues of important figures from Illinois during the Civil War. As the state has produced more accomplished political figures, more statues have been added in the 2nd floor rotunda and outside on the Capitol lawn. Over the years, the building has had its share of tenants: including the legislature, statewide officials and state agencies. The Illinois Supreme Court formerly met on the second floor before their current building was constructed across 2nd Street. The Court’s former chamber is now a Senate hearing room. Next year will mark the state’s bicentennial and also the sesquicentennial of the start of construction on Illinois’ current capitol building. With a recent renovation completed, the current capitol looks to keep standing strong for future generations of Illinoisans.